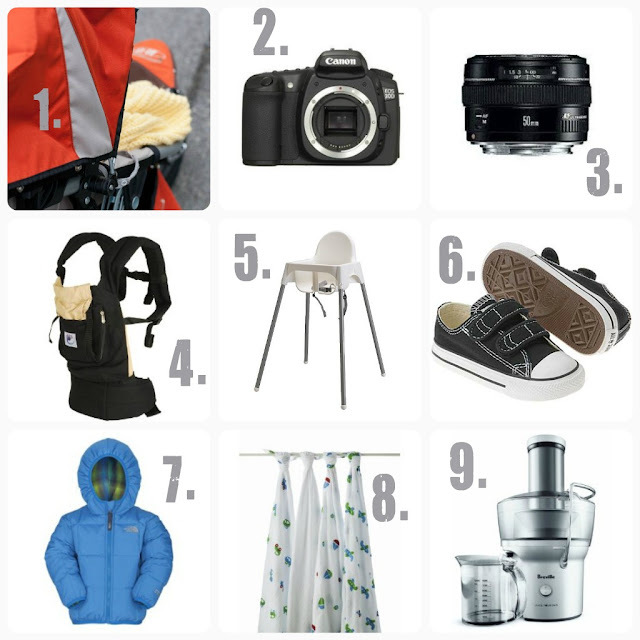 This is a list of my nine most beloved products as we transition into toddler-hood. I've said it quite a few times already on this blog but we love the BOB. Its our only stroller and at first I thought we would need to get something small for quick trips or traveling but this one definitely is ALL we need. Love love it. When Sully was born and for the first six months after I had a standard point and shoot camera. I took tons of pictures that I will always treasure, however I can't help but look back and wish that I already had my SLR at that point in time. I will NEVER regret getting this camera and still tell Arty that it was the best material gift ever. Plus my brother helped me find it on craigslist during a trip to Phoenix(for a great price)! Thanks Stephen! This is the only lens I have other than the kit lens my camera came with. It is amazing what a lens can do. My brother says that each lens you buy feels like getting a new camera and he is right because its like a total transformation. I'm 100% satisfied with this purchase because for the kind of pictures I take (read toddler) this is all I need. Maybe I will want something different in addition to this one as time goes on. We'll see. I couldn't have lived without this one. I used it so so so much when Sully was an infant and we still use it now. He is so content in there and it is really comfortable for me to wear even as he is getting closer to the 27 pound mark. I keep mine in the car for when he falls asleep in the car-seat and I still need to run errands like grocery shop. I will just strap him in and continue on. We don't miss a beat with this thing. Easy. That is what this highchair is to me. Sully likes sitting in it and I could care less about the mess he makes because there are no crevasses to lodge food into. I just wipe it down after each use and that is it. I also don't think you can beat the $20 price. These were the first pair of shoes that actually fit WELL. He has wide feet and these ones just worked like a charm for him. He had baby TOMS in the same size and I could never get those to velcro shut. Converse is where its at. This was the only jacket he had through the winter here. It is perfect because there is elastic around the hood so it hugged his head and kept him warm. Essential when your child boycotts hats. There is also elastic around the wrists so snow doesn't get inside. The elastic had just the right amount of tension, not too tight. I loved that it was reversible and it washed really well. Great all around coat. Right now I use these to cover up Sully's little legs in the stroller. They are so light weight, so soft, and a perfect size. When he was a baby I would swaddle him in these and also used them to wipe up spit-up. My picky little eater loves fresh veggie juice and I love that he loves it. Cucumber, carrot, beet, celery, apple, lemon, kale...he drinks it up. I've even made him popsicles out of the juice and he likes those too. I am so happy about this purchase. Well that about covers it! I know this list is ever changing but I have a feeling most of these items will stick around for a while. I'm so with you on BOB, Ergo, Chucks and the blankets! Our favorites too. I love the juicer idea. I think I'm going to have to do that. Such a great way to be sure they get enough fruits and veggies!